The U.S. Energy Information Administration provides a long-term outlook for energy supply, demand, and prices in its Annual Energy Outlook (AEO). This outlook is centered on the Reference case, which is not a prediction of what will happen, but rather a modeled projection of what might happen given certain assumptions and methodologies. Today, EIA released an annotated summary of the AEO2016 Reference Case—which includes the Clean Power Plan—and a side case without the Clean Power Plan. The AEO is developed using EIA's National Energy Modeling System (NEMS), an integrated model that seeks to reflect how various drivers of the U.S. economy and the different components of energy production and use will interact to determine energy supply, demand, and prices. The Reference case, which incorporates only existing laws and policies, is not intended to be a most likely prediction of the future. EIA's approach to addressing the inherent uncertainty surrounding the country's energy future is to develop multiple cases that reflect different sets of internally consistent assumptions about key sources of uncertainty such as future world oil prices, macroeconomic growth, energy resources, technology costs, and policies. The alternative cases in the report show the model's sensitivity to different assumptions, which EIA updates and publishes each year. The assumptions that inform the modeling play an important role, and any results should be interpreted with the underlying assumptions in mind. These assumptions and results are discussed in the Annual Energy Outlook and EIA's policy analysis reports such as the studies of removing restrictions associated with U.S. crude oil exports or the then-proposed version of the Clean Power Plan. Policy assumptions tend to be especially complicated. In the United States, policies at the federal, state, and local levels can all affect energy supply, demand, and prices. Often these policies have timelines or other attributes that are revised by subsequent legislation or interpreted by executive departments. Some policies can interact in ways that are difficult to foresee. The AEO Reference case generally reflects current laws and regulations within the simplified but often expanding modeling parameters of NEMS. Technological advances are also inherently difficult to anticipate. The Reference case typically projects technological evolutions rather than technological revolutions. For instance, energy production methods may become more effective and energy-consuming equipment may become more efficient in the Reference case, but EIA does not attempt to identify disruptive technologies or the timing of their availability and widespread adoption. The energy sector has always been dynamic and undoubtedly will continue to change in the future. 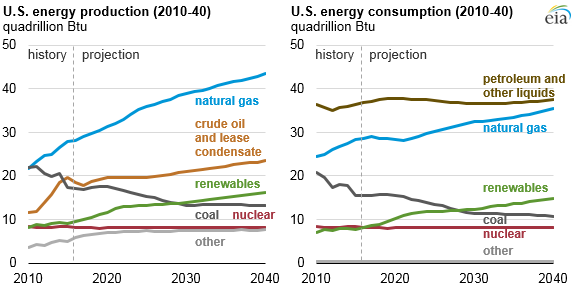 EIA has tried to make its projections as objective, reliable, and useful as possible. However, the projections in the AEO should be interpreted with a clear understanding of the assumptions that inform them and the limitations inherent to any modeling effort.